This Geocache is located at Spitzkoppe, Namibia. 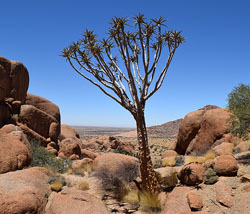 The Spitzkoppe and Pontok Mountains are a group of granite peaks ("bornhardts") located between Usakos and Swakopmund. The highest outcrop rises about 1784 meters (5857 feet) above sea level. 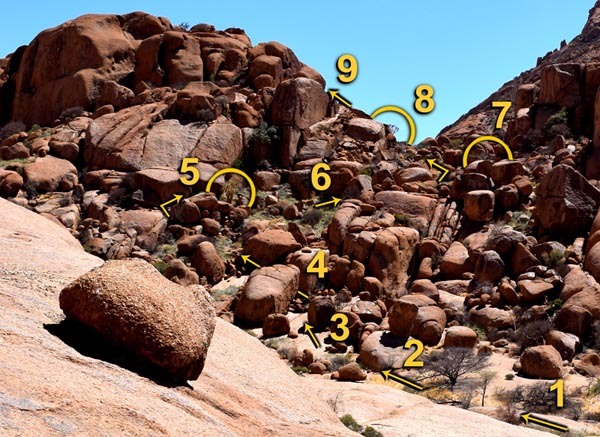 The Spitzkoppe area can be accessed as a day visitor but it is well worth considering staying/camping here to enjoy this amazing place - and to collect all the Geocaches! The Geocache can be approached from various directions and may require a scramble around, over and between the granite boulders. Take care, and take water! If you follow the relatively easy (T=3) zigzag route described below you will pass 3 indigenous Namibian trees that are well adapted to the arid environment. Cyphostemma currorii (aka. 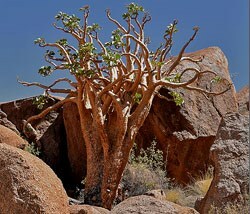 Kobas; Butter tree; Omutindi; kowas) is a succulent tree found in hot, arid rocky places. It reaches a height of over 6m. The species is named after Andrew Curror, a Royal Navy surgeon from HMS Waterwitch, who first collected specimens of the tree in Angola in the 1840’s. The foliage and fruit are rich in oxalic acid, so that the leaves are avoided by browsers, though the fruit is relished by baboons. Sterculia Africana (aka. Tick tree ; Bosluiboom; Sterkulie; Mukosa; #gûuge-anme/s) is a tree that grows up to 8m high that is found on rocky outcrops and hill slopes. It is identifiable by the smooth purple bark that is peeling in papery strips; the broad, rough green leaves; and, the clusters of dry, woody seed capsules. This tree is also known as the False Baobab. Aloidendron dichotomum (aka. Quiver tree; Kokerboom; Köcherbaum; ||garas) is a tall branching species of aloe from 1 to 8m tall. A 6m tall tree was recorded with a trunk circumference of 6,3m! The quiver tree gets its English name from the hollowing out of the tubular branches to form quivers for arrows. The tree is single stemmed. The species name "dichotoma" refers to the repeated forking of branches into two as the plant grows ("dichotomous" branching). Start at the sharp curve in the road and follow the sandy path. Keep left until in a small clearing among boulders. Head up the gently sloping granite slab on the right. Pass between two (closely spaced) large boulders on the left. Head up to the large Kobas/Butter Tree. Move across, ascending slowly, towards the high rock faces. Just a bit off the route on the right side is the Sterculia Tree. 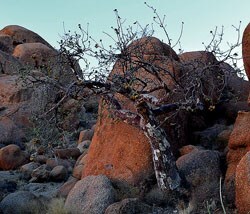 Continue back up between the boulders to the Kokerboom/Quiver Tree. Walk around the big freestanding boulder for an easy way up to GZ. Ybbxvat hc sebz gur Dhvire Gerr, n ubyybjrq bhg obhyqre pna or frra nobir. Ragre gur fcnpr oruvaq guvf naq frnepu ng urnq-urvtug jvguva.